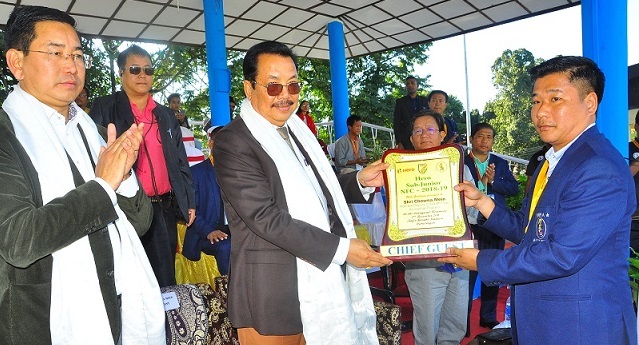 Arunachal Pradesh Deputy Chief Minister Chowna Mein on Sunday said there is no dearth of sports talent in the State and the young sportspersons of the State can win medals for the country at international events provided they are backed by proper infrastructure and coaching facilities. Addressing the inaugural ceremony of Hero Sub-Junior National Football Championships 2018-19 of All India Football Federation (AIFF) which got underway at the Rajiv Gandhi Stadium here on Sunday. Mein said that Arunachal has a great pool of talent and it just has to be tapped properly. “The junior players of the State are doing exceptionally well in several national and international sporting events and at the same time the State government is focusing on providing proper infrastructure to train and develop the budding players. The government is committed to promote and support its sportspersons,” the Deputy Chief Minister said. While appreciating the efforts of Arunachal Pradesh Football Association (APFA) in organizing the event in the State, Meing wished for the success of the event. He also called upon the participating team and players to play the game in the spirit of true sportsmanship. Sunday’s inaugural match was played between Arunachal Pradesh and Maharashtra. The Arunachalee team led by Yura Tarung dominated the match from the beginning and finally went on to win the game by 1 goal. The second match of the day was played between Tamil Nadu and Odisha. The Championships will witness a total of 20 matches being played between the teams from 10 different states from December 2 to 11. All the participating teams are vying to cement their place in the semis of the Sub-Junior Championship which would be played on December 12 and that will be followed by the final on December 15. Arunachal Pradesh has been placed in Group A along with Tamil Nadu, Maharashtra, Odisha and Punjab. Telengana, Goa, Mizoram, Jharkhand and Haryana are placed in Group ‘B’. Among others present Sports and Youth Affairs minister, Mohesh Chai, Mechukha MLA P D Sona, AIFF competition manager, Rahul Paresar, Sports and Youth Affairs secretary Dani Sulu were also present in the event.